iBeacon is one and the only one powerful tool for sending a event trigger to an iPhone be meters away from a beacon. 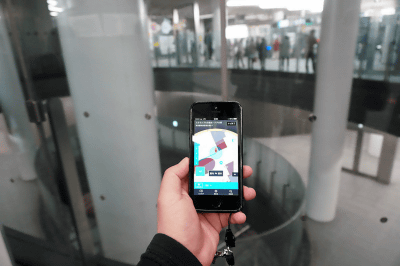 I introduce recent trend of iBeacon in Japan, because I have not read an article like this in English, yet. I talk about beacon manufacturing companies, services that uses iBeacon, and application delopers (iOS and server applications) communities in Japan. Aplix Corporation http://www.aplix.co.jp, translated by Google transate, has been proving beacons since October 2013. Their beacons, product page, translated page, are resonable prices and very unique. The “MyBeacon ™ Pro MB004” is a low cost beacon that starter Pack (10 units included) 10,000 yen, 500 yen / unit 20,000 Lot. Usual beacon has only one bluetooth single-mode module. It is required to receive RF-signals (scanning requests and connection requests) after transmitting advertising packets (beacon packets). This results in large power consumption. Their beacon has two modules as shown in the picture. One module works in non-connectable mode that it never listens for scanning requests and connection requests after sending beacon packets. Therefore power consumption is minimum. The beacon can be configured over BLE through the other module which is connectable and its advertising interval is long to minimize power consumption. This beacon provies touch solutions similar to NFC. Touch interactions is very popular in Japan, for example Osaifu-keitai http://en.wikipedia.org/wiki/Osaifu-Keitai. However using usual beacon that sends radio wave, trasmission distance is about one meter even when transmission power is very small. Their touch solution beacon probably uses leaky cable as an antena. An beacon connected to sensors is the key device to connect the everythings of the world to the internet. This module is for the people who want to make products and services of the original by connecting the sensors and switches. 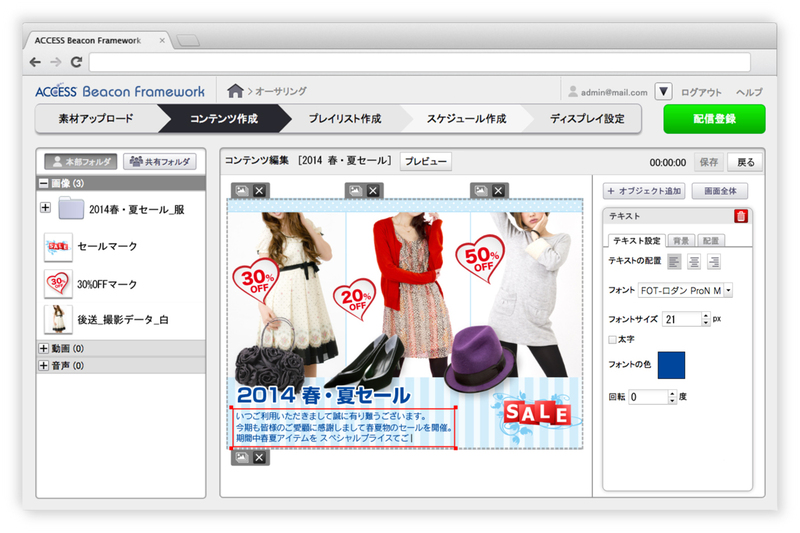 ACCESS CO., LTD. http://www.access-company.com provies beacons and contents manage systems http://jp.access-company.com/news_event/archives/2014/20140130/, translated by Google. The first service using iBeacon appears in a restaurant nearby Shinagawa station on March 2014 https://translate.google.co.jp/translate?hl=ja&sl=ja&tl=en&u=http%3A%2F%2Fiphone.ascii.jp%2F2014%2F03%2F26%2F32432432%2F. Their service uses iBeacon to simply detect customers are in the restaurant. Customers can get some coupons and place an order using the iOS application. As we know, iBeacon is not suitable technology for precise indoor position detection. They uses QR 2-d barcodes to identify customers table number. An indoor navigation using beacons in Shibuya station https://translate.google.co.jp/translate?hl=ja&sl=ja&tl=en&u=http%3A%2F%2Fk-tai.impress.co.jp%2Fdocs%2Fnews%2F20140325_641086.html . When they started the trial on March, they said they used beacons probaly because they had not be licenced MFi(iBeacon). But they probably use iBeacon now. A more sophisticated iBeacon smart order service has emerged on June 26 https://translate.google.co.jp/translate?hl=ja&sl=ja&tl=en&u=http%3A%2F%2Fweekly.ascii.jp%2Felem%2F000%2F000%2F232%2F232144%2F . Smart cushion using iBeacon https://translate.google.co.jp/translate?hl=ja&sl=ja&tl=en&u=http%3A%2F%2Fjapanese.engadget.com%2F2014%2F04%2F27%2Fibeacon-ios%2F&sandbox=1 . An iBeacon handbook written in Japanese.